The Floyd Landis doping case is a doping scandal that featured Floyd Landis, the initial winner of the 2006 Tour de France. After a meltdown in Stage 16, where he had lost ten minutes, Landis came back in Stage 17 riding solo and passing his whole team. However, a urine sample taken from Landis immediately after his Stage 17 win has twice tested positive for banned synthetic testosterone as well as a ratio of testosterone to epitestosterone nearly three times the limit allowed by World Anti-Doping Agency rules. The International Cycling Union stripped him of his 2006 Tour de France title. Second place finisher Óscar Pereiro was officially declared the winner. The only previous Tour de France winner to be disqualified was 1904 Tour de France winner Maurice Garin. Landis was wearing the maillot jaune prior to Stage 16, but then lost eight minutes and seemed finished. However, Landis spectacularly came back in Stage 17, winning the stage and cutting his deficit to leader Óscar Pereiro to half a minute. Overtaking him after the Stage 19 time trial, Landis was celebrated as the winner of the 2006 Tour de France. 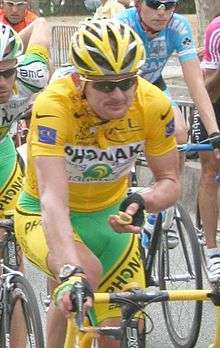 On July 27, 2006, four days after the Tour had finished, the Phonak Cycling Team announced Floyd Landis had a urine test come back positive, having an unusually high ratio of the hormone testosterone to the hormone epitestosterone (T/E ratio) after the epic performance in Stage 17. Landis denied having doped and placed faith in a test using his backup sample. Phonak stated that he would be dismissed should the backup sample also test positive. It did, and Landis was suspended from professional cycling and dismissed from his team. Landis's personal physician Arnie Baker later disclosed that the test had found a T/E ratio of first 12:1, later 11:1, in Landis, far above the maximum allowable ratio of 4:1. The test on Landis's Stage 17 A sample had been performed by the French government's anti-doping clinical laboratory, the National Laboratory for Doping Detection (LNDD). LNDD is a division of the Ministry of Youth, Sport, and Social Life and is accredited by WADA, the World Anti-Doping Agency. The B sample confirmed the A sample, and also tested positive for an unnatural source of testosterone. Following the reported positive drug test on his A sample, Landis suggested that the results had been improperly released by the UCI. On August 9, 2006, UCI president Pat McQuaid rejected the claim, saying, "We acted correctly. We informed the team, the rider, and the federation that there had been an irregularity. Then we issued a press release saying that an unnamed rider had been found positive in the Tour. Landis's team published his name, two days later... I have full faith in that laboratory, and there are stringent measures kept in place by the anti-doping agencies to ensure they proceed correctly." Landis has written a book titled Positively False, which contains his personal account of the case and in which he maintains his innocence. On May 14, 2007 an arbitration hearing began between the USADA and Landis regarding the doping allegations. On September 20, 2007, the arbitrators found Landis guilty of doping. On August 1, 2006 the New York Times reported that according to a source at the UCI Landis's urine test had revealed synthetic testosterone in his body. Despite this, Landis claimed his innocence: "We will explain to the world why this is not a doping case, but a natural occurrence" and that the testosterone in his body was "natural and produced by my own organism." The variety of explanations offered up by Landis provided fodder for many skeptical columns by sports journalists and inspiration for satirists such as late-night national TV show host David Letterman, who presented the "Top 10 Floyd Landis Excuses" on his show. Several experts have refuted Landis's assertions. Landis at first blamed consumption of whisky for his unusual results. This approach was widely ridiculed. Prof. Christiane Ayotte, director of Montreal's anti-doping laboratory, said that "In 25 years of experience of testing testosterone ... such a huge increase in the level of testosterone cannot be expected to come from any natural factors." David Black, a forensic toxicologist for Nashville-based Aegis Sciences, said, "There are not hundreds of plausible explanations. If the tests were so unreliable that there were hundreds of possible reasons, there would be no point in performing the tests." Landis later backtracked from some of the assertions, saying, "The whisky idea was not mine and the dehydration was a theory from the lawyers I hired in Spain to represent me". On September 8, 2006, Landis's attorney announced that he would formally request that the case be dropped on the grounds that LNDD's 370-page report revealed inconsistencies in the way the samples were handled. On August 1, 2006, media reports said that synthetic testosterone had been detected in the A sample, using the carbon isotope ratio test, CIR, conducted at LNDD. The presence of synthetic testosterone means that some of the testosterone in Landis’s body came from an external source and was not naturally produced by his own system. These results conflict with Landis's public assertion that it was a natural occurrence. The CIR test is used to distinguish between testosterone produced naturally by the athlete's body and synthetic testosterone introduced from an outside source. 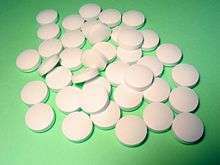 The test is performed by Isotope Ratio Mass Spectrometry (IRMS). According to Gary I. Wadler, M.D., a member of the World Anti-Doping Agency, the carbon isotope ratio test needs to be done only once, on either an A or on a B sample, particularly if the athlete’s T/E ratio is high as in Landis's case. It has been suggested that Landis may have been using testosterone over the long term but either masking it or diluting it to avoid detection. The positive test result would therefore have been from a mistake with the alleged doping program on one day. Landis gave a total of eight samples during the 2006 Tour de France. As part of its prosecution, USADA had remaining "B" portions of the other samples tested by the French laboratory. Four of those samples also showed the presence of synthetic testosterone. On September 11, 2006, Landis asked a U.S. Anti-Doping Agency (USADA) review board to dismiss the doping charges against him. Landis's request was made on the basis that the A and B urine samples from stage 17 of the Tour de France do not meet the established World Anti-Doping Agency (WADA) criteria for a positive doping offense. Landis's lawyer said in a statement: "The single testosterone/epitestosterone analysis in this case is replete with fundamental, gross errors." The lawyer also claims that the positive finding on the B sample came from a sample number not assigned to Landis. The review board notified Landis on September 18 of its recommendation that USADA proceed with the disciplinary process. Howard Jacobs, attorney for Landis, requested an open hearing by the American Arbitration Association to contest potential sanctions against the athlete. On April 14, 2009 the French newspaper L'Express reported information that had been obtained from hacking into the French National Laboratory for Doping Detection was sent to a Canadian counterpart lab from a computer registered to Arnie Baker, Landis' former coach. The French police later invited Landis and Baker to attend a court hearing to answer questions regarding the issue. On July 31, 2009 the New York Times featured an article on corporate spying in France. The article stated that,"No evidence has surfaced to connect Mr. Landis or Dr. Baker to the hacking, and each has denied any involvement." On September 20, 2007, Landis' doping accusation was upheld by an arbitration panel deciding between him and USADA and Landis was banned for two years. In response to this, International Cycling Union formally stripped him of his 2006 Tour de France title and second-place finisher Óscar Pereiro was officially declared the winner. The only previous Tour de France winner to be disqualified was 1904 Tour de France winner Maurice Garin. Landis was also banned from the sport for two years, dated retroactively to January 2007. Even before the USADA's ruling on this matter, the controversy resulted in the disbandment of Landis's former team, Phonak. Landis agreed not to participate in any racing in France in 2007 to allow him to postpone a hearing of his case there for as long as possible. On December 19, 2007, the French Anti-Doping Agency found him guilty of doping, and issued a two-year suspension, which barred him from racing in France until early 2009. After this verdict, Landis tried to reverse this decision at the Court of Arbitration for Sport. On June 20, 2008, he lost this appeal. In September 2008 Landis moved in U.S. federal court to vacate the CAS arbitration award, contending that the procurement of the award was tainted by partiality and conflicts of interest. Additionally, Landis contested the $100,000 US "costs" award, characterizing it as a disguised punitive award. In December 2008 Landis and the USADA reached a settlement and agreed to withdraw the case with prejudice, leading some to believe that the USADA waived the $100,000 fine in return for the cessation of litigation. Regardless of the reasons for dismissing the case, litigation is now complete and final. "I hope the sampling comes back negative; unfortunately, I think the labs in Europe are very professional." "I would have, because I was there with him that day when he was in that breakaway. I was actually 13 minutes ahead of him and he caught us on his own and then he basically rode us all off the wheel..... I thought that was impossible, what he did. I'm not a bad bike rider and, you know, he made me look like a little kid." On July 28, 2006, Landis appeared on "Larry King Live" to explain his situation and reiterate his innocence. Former seven-time Tour de France winner Lance Armstrong phoned the show to express support for his former teammate. Armstrong expressed skepticism of the French laboratory that conducted Landis's drug test, noting it is the same laboratory involved in some of the doping allegations against him. Armstrong continuously expressed support for Landis and stated his conviction that the process is biased against athletes. In May 2010, Landis admitted to doping, though he continued to deny taking testosterone at the 2006 Tour de France. ↑ Macur, Juliet (2006-08-05). "Backup Sample on Landis Is Positive". New York Times. Retrieved 2010-05-02. 1 2 "Backup Sample on Landis Is Positive". Velonews. 2007-09-20. ↑ "Landis gives positive drugs test". BBC Sport. 2006-07-27. Retrieved 2006-08-01. ↑ "Landis gives positive drugs test". BBC News. 2006-07-27. ↑ "Landis sample 'well above limit'". BBC News. 2006-08-02. Retrieved 2006-08-02. 1 2 3 4 Macur, Juliet (2006-07-31). "Testosterone in Landis's Body Said Not to Be Natural". New York Times. Retrieved 2006-08-01. ↑ Eustice, John (2006-08-16). "What if Floyd Landis were innocent?". International Herald Tribune. Retrieved 2006-08-16. 1 2 Macur, Juliet (2006-07-31). "New Finding Challenges Tour Champ's Claim". New York Times. Retrieved 2006-08-01. ↑ "Cycling boss rejects Landis' claims : 'It is an unconditional war against doping,' UCI chief says in interview". MSNBC. 2006-08-09. ↑ Schmidt, Michael (2010-05-21). "Landis Admits Doping, Accuses Top U.S. Cyclists". New York Times. ↑ L'Heureux, David (2007-02-07). "Floyd's Hearing Date Set". Bicycling. ↑ "Arbitrators say Landis is guilty". CNN. 2007-09-20. Retrieved 2014-12-28. ↑ Ratto, Ray (2006-08-07). "Landis's excuses like 1,000 monkeys with typewriters". CBS Sportsline.com. ↑ "Top Ten Floyd Landis Excuses", Late Show with David Letterman, July 27, 2006. ↑ Macur, Juliet; Kolata, Gina (2006-08-02). "Experts Say Case Against Landis Is Tough to Beat". New York Times. ↑ "Landis: Kitchen sink defense UCI, WADA's fault". ↑ Saraceno, Jo (2006-08-09). "Landis's excuses just don't add up". USA Today. ↑ "Landis blames testing procedure". BBC News. 2006-08-08. ↑ Medcroft, Steve (2006-09-09). "Landis lawyers demand that doping case be dismissed". CyclingNews. ↑ "Synthetic testosterone found in Landis urine sample". Associated Press. 2006-07-31. Archived from the original on 2007-12-12. Retrieved 2007-09-25. ↑ Hersh, Philip (2006-07-31). "French-fried conundrum Landis doping case not at all clear-cut". The Chicago Tribune. Retrieved 2006-08-01. ↑ DeSimone, Bonnie (2006-05-16). "Breakdown of Landis' Tour de France drug tests". ESPN. Retrieved 2006-10-16. ↑ Charry, Gene (2006-09-13). "Landis asks USADA to drop case against him". London: Guardian. Retrieved 2006-09-14. ↑ "Landis states his case to USADA". Sport: Cycling. BBC. 2006-09-13. Retrieved 2006-09-14. ↑ Jolly, David (2009-08-01). "In French Inquiry, a Glimpse at Corporate Spying". The New York Times. Retrieved 2010-05-02. ↑ Hood, Andrew (2006-08-15). "End of the road for Phonak". Retrieved 2006-08-15. ↑ "Mom keeps the faith / LeMond: Take High Road". PE.com. 2006-07-27. ↑ "CNN Larry King Live Transcripts:Interview With Floyd Landis (July 28, 2006)". [CNN]. Retrieved 2010-05-02. ↑ "Floyd Landis reveals: I took drugs during my career - but not when I won the Tour de France in 2006". Daily Mail. London. 2010-05-21.